UNICEF estimates that 30%-40% of all mine victims are children under the age of 15, and a growing child typically needs a new artificial limb every six to twelve months. These statistics illustrate the destructive potential of land mines and the extroadinary cost, in terms of quality of life and resources, that they generate. Although there are no known facts regarding troop casualties from land mines in Afghanistan, historically, the trend is not positive. In the Italian campaign of 1944 land mines accounted for 4.4% of U.S. casualties, in Vietnam the percentage rose to 33%. 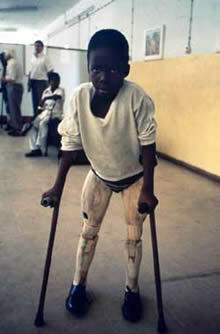 In 1990 land mine injuries accounted for 90% of combat related casualties in El Salvador. ©2003 Center for International Rehabilitation. All Rights Reserved.